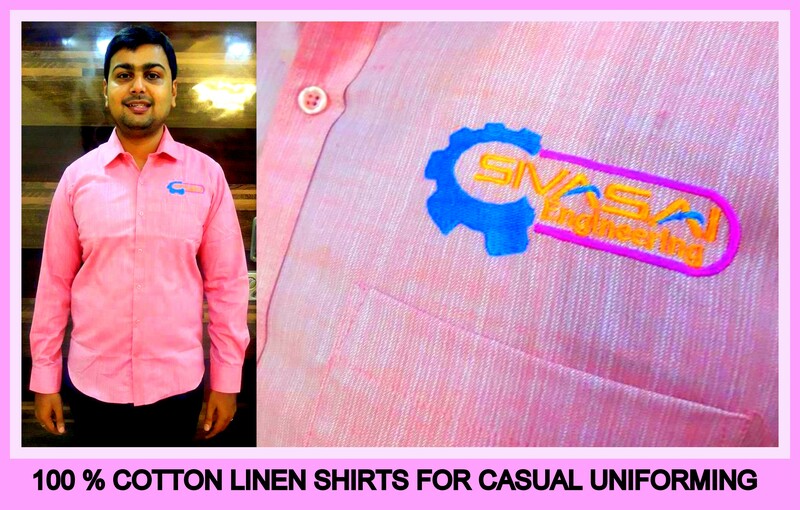 Uniform formal shirts in Cotton Linen material !! RSM Uniforms now have upgraded themselves to provide 100 Cotton linen fabrics as formal uniform shirts. This linen fabric comes in bright as well as dark colors based on your requirement. The minimum order quantity is 50 pcs and the time required to fulfill a order is 25 to 30 days. The fabric displayed above is cotton linen and the embroidery is done from japanese barudan machines. If you are looking out for corporate uniform suppliers in Chennai. Look nowhere call us now and we would be glad to help you with your uniform requirement. Happy to help you. Call us now or visit our website http://www.chennaiuniforms.com.